Ultrasound machines vary in size and mobility. The quality of the machine cannot be determined by its size or portability. Outstanding machines may be relatively large or small (in size) and either mobile or stationary. An analogy between ultrasound machines and computers may illustrate this point. Powerful small portable computers are also available. 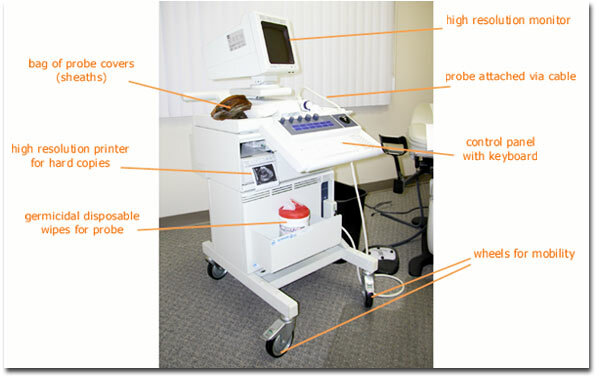 This photograph shows one example of an ultrasound machine that is often used for office based infertility work. The transvaginal probe is held on a holster at the side of the machine and attached to the base unit via a cable. The cable for the probe is relatively long and the operator should take care to avoid running it over with the wheels when moving or positioning the machine. A control panel allows the operator to adjust the settings for the ultrasound machine to optimally view the desired tissues. The monitor displays the ultrasound findings, with each complete scan producing an image called a frame. The transducer is pulsed to provide many frames (cross sectional images) per second. The frame rate (number of images displayed per second) is often around 20-30 per second, which is adequate for viewing the fetal heart beat (may beat around 150 times per minute or 2-3 times per second). The image can be frozen when desired using a button on the control panel. Then objects on the screen can be measured. Cameras with printers are available to take a photograph of the frozen screen image. Prints are generally immediately available using high density print paper. The probe must be appropriately disinfected between uses. There are a variety of acceptable techniques that may be used. The germicidal premoistened disposable cloths shown here wipe down the probe between patients and are bactericidal, tuberculocidal, and virucidal. The probe may alternatively be immersed in a germicidal solution between uses. The probe is covered between patients with a disposable plastic sheath (condom) containing the transducer gel.